what is a date night in box There is no better way to give you a clear idea of what’s in our boxes than to show you the exact boxes our customers have already enjoyed! We are different than most other subscription boxes out there. The items we include in each box come together to create a complete experience. We encourage you to continue to read and decide if a Night In is a good fit for you and your loved one. o u r g o a l fo r t h i s d a t e What is key to your and your partner’s relationship? 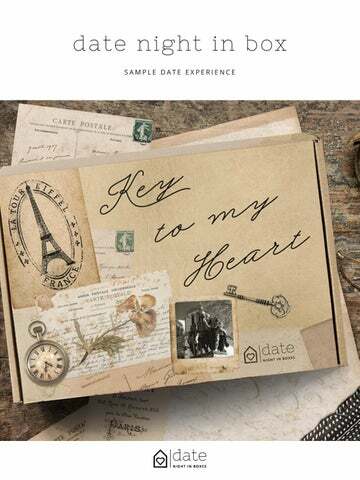 “Key to my Heart” provided couples the opportunity to dive deeper into their relationship while completing unique activities. what our customers experienced Couples worked together to solve an â&#x20AC;&#x153;escape roomâ&#x20AC;? type challenge from the comfort of their home. Our customers also discussed the physical and emotional health of their hearts through our partnership with the American Heart Association for American Heart Month. The best part about Date Night In Boxes is that everything is included in the box. We keep the element of surprise. Our Date Night In seekers do not know the contents of their box until it arrives at their front door! whatâ&#x20AC;&#x2122;s included Several activities | A snack for two | Something to set the mood for the date | A custom Spotify playlist | A suggested, custom curated dinner menu | And so much moreâ&#x20AC;Ś.
optional dinner menu (THAT OUR CUSTOMERS LOVE!) Each Date Night In Box includes a custom curated menu created with love by our friend, Marina. We also offer a printable grocery list, tips, tools necessary and some suggested solutions to those who have common allergies. GET TO KNOW MARINA… Marina is a mom of two and creator of her food blog, Marina Makes. While juggling two kids, keeping up with blog posts and freelance writing, she’s appreciated alone time with her husband more than ever. Quiet nights at home are their ideal date night, which is why they’re thankful for Night In Boxes. Being a huge foodie, Marina believes that a delicious, quiet meal at home can be just as great (if not better) than a meal out on the town. Marina is dedicated to bringing easy and scrumptious recipes to all subscribers in hopes that the menus she crafts will elevate the Night In Box experience even more. some of our previous dates sent to our happy couples! did you know? WE HAVE A KIDS BRAND! 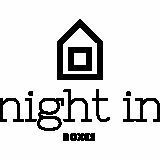 Kids Night In Box is a custom created, memorable subscription experience that brings families together in the comfort of our customerâ&#x20AC;&#x2122;s home. Each Kids Night In Box includes interactive activities such as get up and go fun, a custom book, music and a tasty treat all centered around life lessons inspired by real life mom adventures. We hope to bring children together with an influential adult in a creative, fun and meaningful way. In addition to our customers receiving a custom curated experience each month, they become part of a larger community that allow for an experience to be enjoyed beyond the box.